Yes, Virginia, You Can Mow Your Lawn Too Often!! I have a neighbor that loves his yard work. He’s out cutting the grass, trimming around the sidewalks, and blowing away the debris at least 3 nights each week. I’m incredibly aware of this because of the noise that continues for about 2 hours. Despite all of this work, I’m sorry to say that his lawn is not the beautiful carpet that he wishes it to be. Like many homeowners, he makes the mistake of cutting his grass too short and too frequently. Coupled with the use of non-organic fertilizer (which creates very short roots in the grass, thereby drying out rapidly in between rains), mowing too often or putting your mower blades too low creates a lawn that struggles to survive when the sun gets hot and the rain clouds fail to appear. The University of Illinois Extension has created a nice one-page guideline for mowing lawns properly. Click here to read it. Each winter brings challenges for our outdoor landscapes, and when spring comes, we find winter injury on lawns and other plants. Some of these problems can be avoided with proper winter maintenance. Be careful when shoveling, plowing, or blowing snow so it doesn’t land on tree or shrub branches and crack them. Frozen branches can be easily damaged, and that damage can ruin the plant’s structure forever. Also, don’t remove snow from the lawn grass. Snow helps insulate the soil so it doesn’t freeze as hard. It also protects the crowns of the grass plants from the drying winter weather. The snow keeps them dormant until the time is right to start growing. If possible, avoid mountains of shoveled snow, because deep piles that melt into chunks of solid ice can smother the grass, resulting in dead spots. Salt is very harmful not only to lawns, but to trees, shrubs, and perennials when it gets in the soil. If you use products to melt ice on walkways and drives, look for one that does not contain sodium chloride and is environmentally friendly and safe for plants. When you shovel treated areas, try not to pile salt-laden snow all in one place, or near plants that may be damaged. Once snow starts melting or if we get a winter thaw and lawns and gardens are exposed, don’t walk on them. That can damage the grass and compact the soil. Visit our previous blog post on alternatives to salt here. Fall is the most important time to fertilize your lawn. If you only do it once a year, do it now! Research, based on the growth cycle of turfgrass, shows that Labor Day is the best time to fertilize. Memorial Day is the second-best. Fertilizer is most effective when the highest amounts of root and shoot biomass are present to absorb and use it. Nitrogen, phosphorus and potassium are the macronutrients that lawns need most. Test your soil before applying fertilizer blends so you know whether fertilizer is needed and what type to buy. Apply no more than 1 pound of nitrogen per 1,000 square feet per feeding, and a maximum of 4 pounds per year. Nitrogen is usually the limiting factor in turf growth, because it doesn’t accumulate in soils as phosphorus and potassium do. Lawn maintenance fertilizers with 25 to 50 percent of the nitrogen content in a slow-release, or water-insoluble form are best. They release nitrogen slowly rather than all at once, minimizing nitrogen loss due to leaching. Leaving grass clippings on the lawn and applying 1/4 of compost reduces nitrogen fertilizer needs, too. There is a statewide ban on phosphorus in turf fertilizers, with an exception for some organic products in some counties of Wisconsin. Phosphorus, which helps build strong roots, may be recommended in soil tests if you are starting a new lawn from seed or maintaining a lawn in low-phosphorus soils. If testing recommends application, bring your soil test results to the store in order to purchase turf fertilizers containing phosphorus. In south-central and southeastern Wisconsin, we often have high to excessive amounts of phosphorus in our soils (especially in urban soils), so more is not recommended. However, this isn’t the case statewide. Potassium helps turf increase its disease and drought resistance and prepare for winter dormancy. Potassium is present in higher amounts in winterizer turf fertilizers, but this doesn’t mean you can only apply it in fall. In many areas of Wisconsin, we have high potassium levels in soils, so it may not be needed. Research by University of Wisconsin turf specialists suggests new recommendations regarding summer fertility for lawns. An application of lawn fertilizer around the Fourth of July might be warranted. This summer application is in addition to fertilizing around Memorial Day and Labor Day. Each application should provide 3/4-1 pound of actual nitrogen per 1,000 square feet of lawn, but follow the manufacturer’s recommendations on the bag. Fertilizer applications should be followed by watering or applied just before it rains. Do You Feed Your Trees? Here’s a question that tends to divide folks right down the middle. When it comes to the wisdom of feeding trees, expert opinion is sharply — in some cases acrimoniously — divided, but the weight of modern practice is increasingly in favor of the dictum that less is more. A small amount of fertilizer is fine. It will help compensate for the absence of natural fertility that tends to distinguish lawns (where all the leaf litter gets raked up and there is no understory to speak of) from woodlands (where the trees are nourished by lots of decayed plant material). But before you go out and buy tree food, remember that the small amount needed is likely to be already present as a by-product of fertilizing the lawn. Once you get into adding more than that, it’s likely you will do more harm than good — if you do anything at all. The harm comes because fertilizer pushes the tree into making lots of tender, soft growth. It’s lush, it’s green, it’s very impressive, and it’s also highly vulnerable t insect attacks, climate stress, and the myriad fungus diseases that would be thwarted by tougher tissue. The doesn’t-do-anything-at-all situation results from putting the food where the tree can’t get at it. Most of a tree’s feeder roots are in the top 10 to 18 inches of soil, and most of them start near the out edge of the canopy (the drip line) and spread outward from there. That means using an injector to put the eats down deep is not going to do much except pollute the groundwater. And spreading the tree’s meal close to its trunk will be just as fruitless. The bottom line: keep feeding to a minimum unless the tree is in a container where it cannot possibly find nourishment on its own. And if you do use fertilizer on a landscape tree, spread it in a wide band that works out from the drip line. Everyone wants the perfect sea of smooth green lawn with nary a hint of weed, bare spot, or discolored grass. Alas, easier said than done! However, here are 5 steps that will help create a beautiful and naturally weed-resistant lawn. Prepare the soil. Though they are seldom thought of that way, expanses of mown grass are actually very intensive gardens. Loose, fertile soil of the right pH is even more important for good lawns than it is for tasty tomatoes or lavishly blooming shrubs. Invest in the best seed, use enough of it, and plant it at the right time. The first defense against weeks is a turf that is thick enough to prevent them from getting the light they need to sprout and grow. The grass won’t be thick if you’re stingy with either quality of quantity, and it won’t fill in properly unless you give it a proper start. Think long term. Be sure the seed mixture comprises grasses that will be long lived, such as red fescues and bluegrasses. There should be only a very small amount of rye grass, if there is any at all. Rye grasses grow quickly, helping the lawn to look good fast and preventing the growth of some weeds. But because they are up so quickly, they steal nutrients, water, and light from slower-growing but more durable types. As a result, newly established turf has a lot of rye in it. This is fine for a short while. But even perennial rye dies out within a few years, and when it does it leaves a whole lot of room for weeds to move in. A sprinkling of rye can be used if you are the impatient type. But you’ll have better long-term weed control if you go for the slow stuff and hand-weed for the first year or so while the good grasses are settling in. Adjust the mower to the season. No matter what height you like your lawn, letting it get a bit shaggy in summer — a good 3 inches tall — will cut down on weeds. The taller gras provides more shade, keeping the grass roots cool and healthy while making it harder for weed seeds to sprout and find the light. For those of us who become frustrated at the growth of weeds in our lawns when we’re using organic fertilizers, there is one help: corn gluten meal, a by-product of corn milling. It is quite high in nitrogen, which makes it a good fertilizer for grass. And it will prevent weed seeds from growing. But — there’s always a but — that’s it. Corn gluten kills by drying up the baby sprouts as soon as the seed cracks open. It has no effect on perennial weeds (other than to encourage them) or on annual weeds that are already growing. Furthermore, it must make good contact with the weed seeds in order to kill them, not a problem on bare soil but a tricky proposition if the grass is reasonably thick. It works best when the soil is warm, by which time many annual weeds have long since been up and about. And it lasts for only about six weeks, so you have to apply it frequently. All that said, corn gluten is a relatively benign fertilizer, and it can help control annual weeds if you use it faithfully, from spring to fall, for a couple of years. 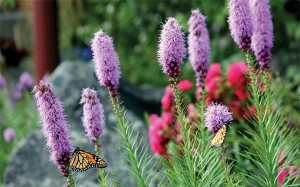 It is nontoxic and, in home-garden quantities, safe for the environment.